New Popular 500gm Session Pack of Boosted Feed Pellets that will give you the edge over standard fishmeal pellets this time of the year. 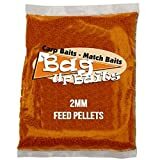 Popular session pack of Boosted pellets for a few hours fishing for light feeding for all carp and coarse fish. This entry was posted in Carp Baits and tagged baits, Boosted, Carp, Delivery, Free, Frutti, pack, Pellets, Session, Tutti. Bookmark the permalink.